It’s been one of those busy months where some days I have to triple-check just to make sure I brushed my teeth in the morning. I’m working on an update to my 101 in 1,001 list because i’m actually making some good progress, but it seems I’m so busy doing things that I don’t have time to write about them. A blessing and a curse, I suppose. Two things- First, we have 2 winners from the 100 Days to Christmas giveaway! Congratulations to Maria Starr and Danica- I’ll be emailing you this week to get you your free copies of the 100 Days to Christmas eBook from ListPlanIt, so you can catch up on last week’s preparations (something I need to do myself). And second, I’ll fill in the void recently opened in my renewed blogging mojo by posting a pic of the kiddo. This was her face in the ride to the airport a few weeks back, where I headed to my first post-baby business trip (aka the first time I was away from the baby for more than 8 hours). Is it just me, or does someone look happy for me to be leaving? So much for a Hollywood movie-style reunion. Did you know that on September 16th, there were 100 days left until Christmas?!? Does that not completely blow your mind? I’m sure all of you are having a “where on Earth has this year gone? !” moment just like I had yesterday. I’m embarrassed to admit the things I have done due to my lack of holiday preparedness over the years, but I’m all about full-disclosure over here. How about Christmas cards, for instance? I LOVE getting holiday cards (who doesn’t?! ), but can only remember sending them out once in the last *10* years… And that was only because it was the year we got married, so I had a good wedding picture we could send out. And I think I only sent them out a week before Christmas. I kept telling myself “Well hey, they say Happy New Year on them too, so it’s not like sending them December 20th is really that bad…” Come on, Lulu. Or how about the years we’ve bought a Christmas tree the week of Christmas? Heaven forbid I just leave it up until Epiphany per my family’s tradition and then just get rid of it… So I end up having a Christmas tree in February. Good times. The infamous “2010 Tabletop Christmas tree” bought the of Christmas. Pretty sure this one stayed up until February as well. Well this year, my friends, is going to be different. 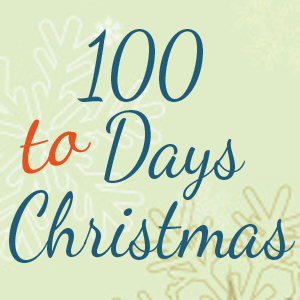 As part of my 101 in 1,001 list, I’ll be following the 100 Days to Christmas eBook on ListPlanIt. Jennifer Tankersly has updated her brilliant 100 Days to Christmas for 2012, and it’s better than ever. She walks you through an activity to do each an every day leading up to December 25th- each and every one aimed at getting you prepared for Halloween, Thanksgiving, AND Christmas in a way that takes the stress out of planning and allows you to enjoy your holiday more. For those of you that are hyper-organized, she has already corralled every printable you could ever hope to have in your holiday prep binder, and will give you great suggestions you may never have thought of. And for those of you like me, who are hyper-UNorganized, it’s like having your crazy organized friend hold your hand and tell you what to do to be prepared. Pure bliss. I’m excited to announce that I’ll be giving away *2* copies of Jennifer’s eBook on Friday. Use the Rafflecopter widget below to enter! You’ll get 1 point for telling me a time when you felt unprepared for the holiday season, and another point for tweeting the giveaway via Rafflecopter. Best of luck entering! My 30th birthday didn’t just include my mom driving down from Dallas for the weekend to play babysitter while the Mr. took me out for a surprise dinner (there’s so many restaurants near me and I still didn’t guess which one it was!) and piano bar date. I didn’t know at the time, but the Mr and Mama Martini had some other tricks up there sleeve. Which allowed me to knock out yet another goal on the list- pow! Since we were on such a tight schedule for my birthday surprise on Friday, we never got around to opening presents or eating the AMAZING German chocolate cake my mom baked and brought down from Texas on my actual birthday. ( Fun fact- apparently it was the same cake I ate on my first birthday. Mama Martini, always rockin’ the little details in life…) We spent the day after my birthday…um… recovering (ahem) from the night before (I did mention all the dirty martinis, didn’t I?). Saturday was spent eating breakfast burritos made with MY FAVORITE FOOD ON EARTH, green chile from Santiago’s in Colorado (another incredibly thoughtful gesture from my mom). Y’all. Words cannot express just how good this is. It’s like Death Row last meal good. My mom and I literally pack insulated lunch bags in our suitcases every time we head home to visit Boulder, so we can stock up on the stuff. So a post-birthday breakfast burrito smothered in this was one of the highlights of the entire weekend. Also? I actually took a nap on Saturday, which is honestly noteworthy for me because I just flat out don’t nap. I have taken precisely *1* nap since I brought the baby home from the hospital… I’m just not a napper. So kudos to my 30th birthday celebration being more exhausting than a newborn baby. We finally got around to cake and presents after the sun went down Saturday night. I scored some amazing fall boots and some Nyx Products from my parents, as well as the only thing I asked for – Rosetta Stone Francais, so I could kick off #16 on the list – learn to speak French. The Mr really took the cake on the gift giving front, and gave me a gift card to JoAnn Fabric so I could buy a new sewing machine. I was floored, and so grateful. I also got a new watch and it was a great gift to receive. It allowed me to learn a bit more about the watch making process which was fascinating. My watch looks great and I wear it everyday!! I can’t remember the last time I had a birthday cake with candles, so that made the night even more special.